Finding a full episode of MTV’s “120 Minutes” on YouTube is an increasingly impossible task, given the site’s propensity for flagging the music in the show’s video’s for copyright issues. That’s why we were thrilled when a sharp-eyed Slicing Up Eyeballs reader recently pointed us to a trove of episodes uploaded to the Internet Archive — including one of our all-time favorites. 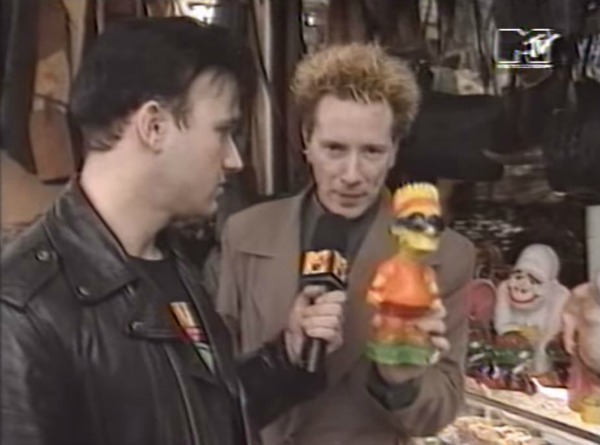 This is the February 1992 episode in which host Dave Kendall is joined in Tijuana, Mexico, by a typically surly John Lydon, who himself was south of the border to film a video with Public Image Ltd. for the song “Covered.” We’ve posted excerpts from this episode in a previous installment of “120 Minutes” Rewind, and noted that this site’s creator was at that particular video shoot. Stick around to the end and there’s some bonus footage of Kurt Loder hosting “The Day in Rock” with footage of The Cure’s press conference announcing the Wish tour and a segment on future dead music formats the MiniDisc and the Digital Compact Cassette. Watch the full episode — and the video for “Covered” — below. Tags: 120 Minutes, Dave Kendall, John Lydon, MTV, Public Image Ltd. This is PURE GOLD. 1992 was an absolutely stellar year for music, and this is indisputable proof. Whoever taped this, kept this tape for 25 years, digitized it and uploaded it, WELL DONE. Thank you and SuE! I remember this episode. It was when I became a fan of Blur. Can’t watch it right now, but if I’m not mistaken, the next week’s guest was the object of my obsession for almost thirty years now, the goddess that is Johnette Napolitano. Boy, they sure played a lot of the videos to death back then. 90’s one of the best times. My alt-rock band The NightShade Project was forming. Many recordings posted free. EMI screwed us, now we are screwing them.